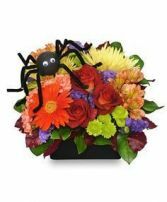 This colorful flower arrangement from DIETZ FLOWER SHOP & TUXEDO RENTAL is a great choice for Halloween and Harvest decorating themes. Seasonal accents like miniature pumpkins give it a special touch of fall festivity! This Bloomin' Jack-o-Lantern from DIETZ FLOWER SHOP is a great choice for Halloween and Harvest decorating themes. Arranged in a whimsical terra cotta pot, this flower arrangement beautifully captures the essence of fall! 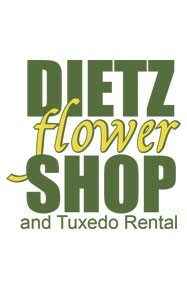 October Offerings from DIETZ FLOWER SHOP & TUXEDO RENTAL is a great choice for Halloween and Harvest decorating themes. Accented with dried wheat, mini pumpkin and seasonal ribbon, this flower arrangement beautifully captures the essence of fall! I know what you're thinking, "Flowers for Halloween?" You might be surprised at what creative florists have up their sleeve. Let our experts help you plan your Halloween decorations and haunted houses. From your front door wreath, to your ghoulishly gorgeous centerpiece, DIETZ FLOWER SHOP & TUXEDO RENTAL will help you turn your Halloween get-together into a Halloween party no one will ever forget.